I’m measuring about 6” x 46/48ish, with very uniform medium brown coloration. The wrapper seems to telegraph every single detail underneath, which gives it a bit of a rustic appearance; it’s “slightly very” lumpy – the lumps are slight in magnitude, but prevalent in occurrence. There isn’t much in the way of aroma from either wrapper or foot. Also, as I’m sure zedman would point out if he were here on the show with us, we’ve had these for almost two years (Dec 2016? )….I do not know actual age since rolling. My size is also 6×46 with a very spongy feel and slightly light weight in the hand. This telegraphs Cuban Custom rolled cigar from the appearance and color. The wrapper has the hallmark flavorful “look” but without the beauty that a top graded wrapper leaf would have. The look is akin to a wet wrapper application. It telegraphs the texture with a minutely different coloring or shadow. The foot is closed and the prelight seems greatly diminished, as if it’s been diluted over the years of being loose in a plastic bat. Join us next time for Episode 187, featuring the Asylum Ogre 7x70. If you would like to contact us, use any of the methods on the Contact Page. 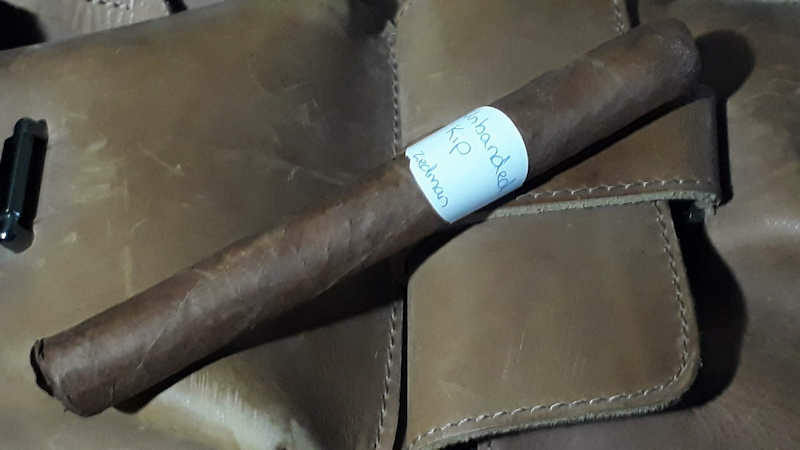 Past episodes are in the Half Ashed Archive. You can download this week’s audio directly in the summary at left, find us on iTunes, or subscribe with any podcast app at our RSS Feed. Raw video is available at the Half Ashed YouTube Channel.